This movie is a wonderful reason to prove my point of view that everything in life must be done as an artistic expression. “The Artist” is a magnificent piece of cinematic experience, not only because it brings us back to basics (what is a film, how should actors play, how can the sound, the point of view of the camera and the black and white colors express all the detailed aspects of different emotions), but also because it makes us better humans. 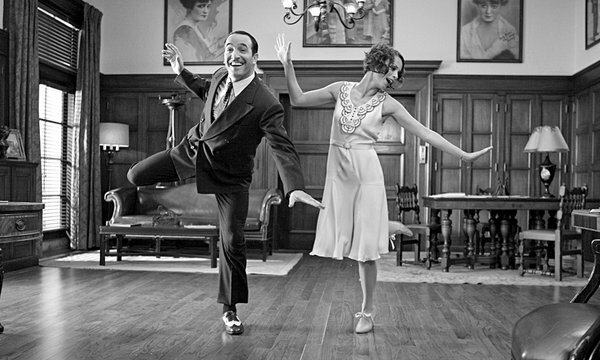 During the 100 minutes of “The Artist” we enjoy not only a warm and lovable film, but we are reminded a very important lesson – that cinema was created to convey natural human feelings and bring people from different places and cultures together. The lack of dialogue and colors don’t make this movie more introverted. They serve a very special purpose – to bring forth every gesture, every mimic, every touch and facial expression, which we miss even in our every day life. This is another reason why “The Artist” is such a treasure. I must say – the aristocratic crisis of the main character is such a powerful symbol! Every single person has some kind of a talent. And when we develop it, our ego grows with it. But we really recognize our own features only when we meet another gifted person. And this is how the two main characters collide and show us the true virtue of life – love. From this moment on George Valentin and Peppy Miller are entangled into one fate and future. They save each other from the true grayness of life. So when we see them dance at the end of the film, we are truly and heartily happy for them. And the creme de la creme is the breathless finale of this masterpiece of film making.